The heroes in the ambulances and in all of Gaza’s hospitals are working 12-24 hrs shifts, grey from fatigue and inhuman workloads (without payment all in Shifa for the last 4 months), they care, triage, try to understand the incomprehensible chaos of bodies, sizes, limbs, walking, not walking, breathing, not breathing, bleeding, not bleeding humans. HUMANS! Ashy grey faces – Oh NO! not one more load of tens of maimed and bleeding, we still have lakes of blood on the floor in the ER, piles of dripping, blood-soaked bandages to clear out – oh – the cleaners, everywhere, swiftly shoveling the blood and discarded tissues, hair, clothes, cannulas – the leftovers from death – all taken away…to be prepared again, to be repeated all over. More then 100 cases came to Shifa last 24 hrs. enough for a large well trained hospital with everything, but here – almost nothing: electricity, water, disposables, drugs, OR-tables, instruments, monitors – all rusted and as if taken from museums of yesterdays hospitals. But they do not complain, these heroes. They get on with it, like warriors, head on, enormous resolute. An then, just now, the orchestra of the Israeli war-machine starts its gruesome symphony again, just now: salvos of artillery from the navy boats just down on the shores, the roaring F16, the sickening drones (Arabic ‘Zennanis’, the hummers), and the cluttering Apaches. So much made and paid in and by US. 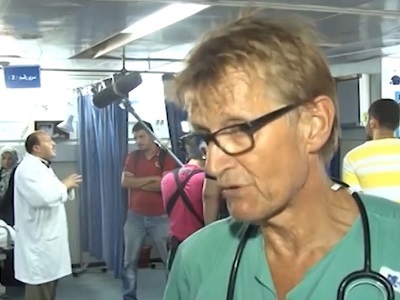 – Mads Gilbert is Professor and Clinical Head, the Clinic of Emergency Medicine, at the University Hospital of North Norway, in Tromsø, Norway. He volunteers in Gaza. Hats of to the doctors, but sadly the Muslim world has no time to think or do anything for the Muslims suffering in Gaza. Gulf countries are more worried about 2020 expo and after all the massacre the people of palastine can be made happy with the money we give them. ALLAH protect Gaza coz the Muslim world is too scared to question Israel. Why don’t you write about the Israeli nurse who is currently treating a baby from Gaza while her own son is endangering his life in Gaza in order to bring quite and safety for Israeli citizens? This is something you yourself would not have done. So I don’t take my hat off for you, You clearly do not deserve it. Next time try to write at least one true sentence. Sigal, the nurses son is a willing part of a murderous “army”. Maybe there is a nurse in Israel treating a baby from Gaza (or is it something you dreamed up) but the baby could be treated by doctors in Gaza IF Israel would stop bombing Gazan hospitals. Let’s have some truth from the Israeli side, it would be a refreshing change. Thank you to all the doctors that are committed to help the Palestinian people. What a sad thing to see. 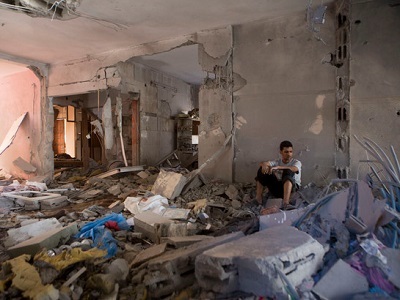 The Israeli’s will eventually get what they have done to the Palestinian people. Barack Obama is due for a second Peace Noble Prize for, not only ignoring the very visible s(h)ituation Israel is creating in Palestine, but also supporing Israel with all the billions in military aid. What I failed to understand also is Angela Merkel’s (Germany) Statement that ”she understood Israel’s Need to defend itself”. Defend itself from what Mrs. Merkel? Israelis are the occupiers. If at all, then the Palestinians are defending themselves. And I suppose that the mess in Ukraine has priority as that’s where European interests are. The plane shot down by the Russian separatists needs urgent attention not the massacre in Palestine. – I kiss your hand Mads Gilbert. My heart cries out to all of the medics , nurses , cleaners & staff working around the clock in Palastine. As an Haematology /Oncology nurse I deal with grief , death & suffering on adaily basis. I cannot comprehend the scale of what is happening in Palastine. I cannot comprehend the above comment from an Israeli nurse , when a country is occupied the occupiers dont see the people as HUMAN beings, perhaps , this is how the Israelis can carry on & inflict this suffering.Israel is WRONG & should be tried for war crimes , this is genocide. I couldn’t have said it better Julie Anne. And Anonymous yes, the arab rulers in the middle east are terribly scared, afraid to lose their own power in the event they raise their voices. Even the desert has ears and with oil the path of interests is paved. Don’t defy the USA, check Afghanistan, Iraq, Libya……. Palestine has nothing to offer. Stop. If the same happens with his child and is in the intrest of Israel ,he ll let it happen ,and support Israel. may Allah bless all of the team working in the hospital. Dr Mads u r doing a great job i am paediatrician from Kashmir i can understand the pain and grief through which people and especially children of Palestine r going…..
Shame to international community….Shame to America…Curse on Israhell…. The blood of innocent people will not go into wastebasket that day is not far when Palestine will be free…Insha’Allah.